Alembic Club: RECORD more than you ERASE ! There's some great reading here and many tangents. I'll put up some links as I wade through the thread. I've found hundreds (if not thousands) of fantastic pics and recollections on Steve Hoffman's site. I'll admit I hadn't heard of him before the internet.Does anyone here have some stories or info that would make me feel smarter? This is indeed a great site. I have browsed it before in the past. 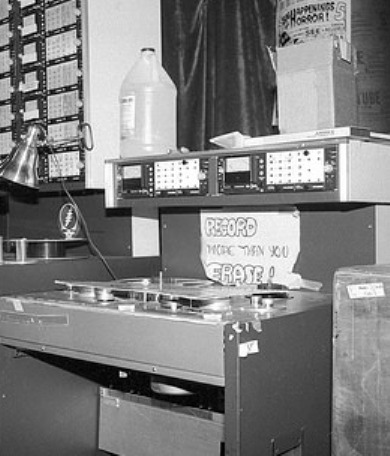 The tape machine in the picture is a Studer A-80 variation. I have worked on Studer, Ampex,MCI & Otari studio machines and still put them into use for transfer and archival work. Wow, love those links. Thanks for sharing, Wolf! Hi Wolf you might be the right person to advise me here. I have some 1/4" reel -to - reel masters that are from a recording in did with my band around 1978 and they have been stored in my house in the original boxes in a plastic bag since that time. I contacted the recording studio that did the original sessions about transferring them to digital. He recalled they were either mastered on a Fostex or Teac reel to reel in those days. But his advice was don't do anything with them until they have been baked otherwise you could lose the coating and ruin the recording. There is a company in London who could do it but that it could be expensive and no guarantee of recovering the recordings fully. What do you know about that process and what would you advise? Good question Jazzy. I also have 1/4" reels from the late 70's of my first band that I'd someday like to get onto CD so any advice would be great. Hello friends , in answer to Jazzy and Jacko regarding reel to reel tape transfer and restoration there are many questions and variables in this regard. I have been doing tape transfers in various levels of the process and am a member of both the Ampex List Forum and the Studer List Forum and am extremely fortunate to be able to confer with highly esteemed folks who are also forum members . Richard Hess, Jamie Howarth of " The Plangent Process http://plangentprocesses.wix.com/plangent , Steve Puntolillo of the Sonicraft A2DX Labs are Ampex list members as well and are operating large facilities engaging in this process. YOUR TRANSFER MACHINE MUST BE DEMAGNETIZED AND IN PROPER ALIGNMENT ! There are various ways to go about this and various levels of expense to be considered . 1) A good prime directive regarding in handling of the tape is " DO NO HARM "
2) Know exactly what the tape base is ACETATE , POLYESTER or MYLAR. Such as AMPEX 456 or 3M 111 or AGFA PEM 468 .... ... etc ... .
Get a decent high end analog to digital interface with great converters and put the digital transfers a a storage hard drive and NOT your OS system drive. If you cannot afford the top method such as Plangent process there is software such Sonic Solutions " NO NOISE". WAVES restoration bundle and various programs from ISOTOPE that are less expensive to do. Elwoodblue , do not use your food oven in your kitchen for this !!!!. Thanks for the morning primer,I'll go through some links tonight. (I did bake a strat neck in there once). I love Sour Dough , with cream cheese , avocado and turkey with some hot peppers on the side . Yummy ! That was breakfast. I have one of those Nesco Dehydrators and I have 1/4" reel to reel tapes! I no longer have a reel to reel machine and not sure what is on all of the tapes.